As an authorized PPG Independent Dealer, Fullerton Paint & Flooring is Orange County's best source for PPG Pittsburgh Paints. We offer a comprehensive line-up of PPG interior/exterior paints, primers, sealers, and stains products for commercial or home use, and our coatings experts are readily available to help our customers throughout Anaheim, Fullerton, Anaheim Hills, Yorba Linda, Placentia, Orange, Brea, and surrounding cities choose the right PPG product for their painting projects. Pittsburgh Paints has manufactured quality paints and coatings for more than a century, and has become well known for their long-lasting and highly durable interior and exterior paints. In addition to offering a diverse line of versatile paints, they also feature the innovative Voice of Color program. This interactive online color matching tool allows homeowners, professional painters, contractors, and commercial firms find the perfect paint color for their painting projects. 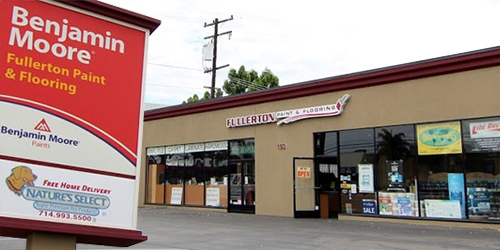 Call or visit Fullerton Paint & Flooring Monday through Saturday to learn more. Having served thousands of customers since 1995, our knowledgeable staff is ready to show you the latest PPG products to match your color scheme and surface requirements.